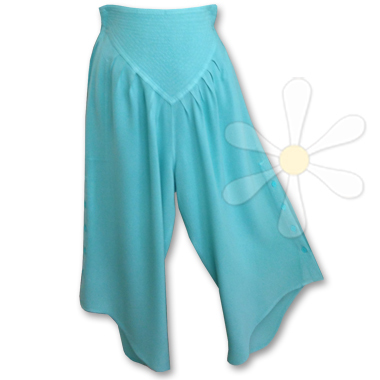 Everyone loves comfy pants -- in delectable moroccan cotton susti, especially -- so what if your pants were as effortless as a skirt? The comfort factor is just one of the many charms of this deliriously soft style, handmade in Morocco of the most delicious sousde -- a cotton/rayon blend we call 'the cashmere of cottons'. When you feel it, you'll understand...! The fabulous details: our as-ever comfy elastic waist around the back and traditional decorative top-stitching across a wide and flattering yoke, side-seam pockets, unique diagonal hemline and wide button-up legs... pure Moroccan design magic!